I am revisiting a blog post I wrote in 2016: Facilitation tip 2: Design the workshop as a story with a beginning, a middle and an end. The drawing that I made then needs a major tweak. Jump or dive? The question is essential. I am no longer happy with my drawing A as jumping to conclusions is seldomly a smart move. Learning is work; for individuals, groups and organizations. There is no shortcut. We have to go through the process of thinking, asking questions, sharing experiences and perspectives, probing and sensing. We have to engage, get involved and be in conversation with each other to address our challenges, advance our thinking and make progress. That is why I got my initial drawing wrong. 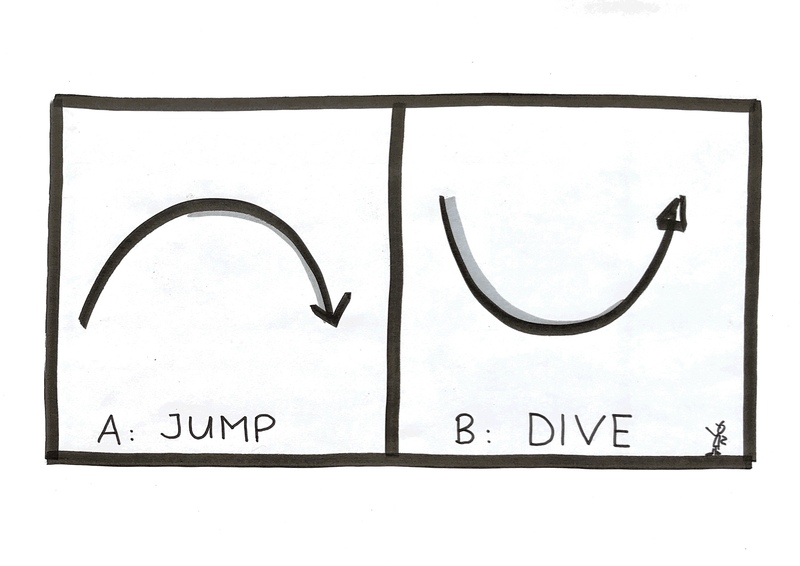 In a facilitation training I was organizing lately, I drew the workshop flow as dive. The diving movement is informed by three concepts: The theory U, the diamond of participatory decision making and the hero journey. As facilitators and organizers of learning events, we have to design for possibilities. We need workshops, retreats, seminars that allow the group to explore an issue or a question deeply and create novel thinking. We need depth not shallowness in our reflection. We have to generate options, new possibilities that reach beyond our abilities and beyond what is currently possible. Expressing differences is natural and beneficial; getting confused is to be expected, feeling frustrated is part for the course. Building shared understanding is a struggle, not a platitude. 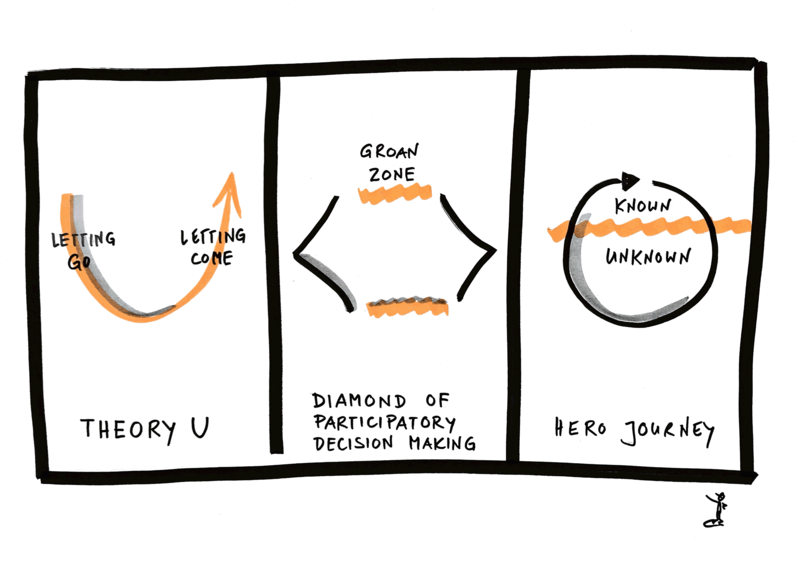 Concepts as the theory U, the diamond of participatory decision making or the Hero Journey are helpful maps guiding the design process. To shift our thinking and gain clarity we need deep and powerful reflection: we go through the eye of the needle where the inner knowing emerges (Otto Scharmer), we traverse the groan zone (Sam Kaner et al. ), or cross the threshold and venture into the unknown world where we are faced with trials and quests (Joseph Campbell). 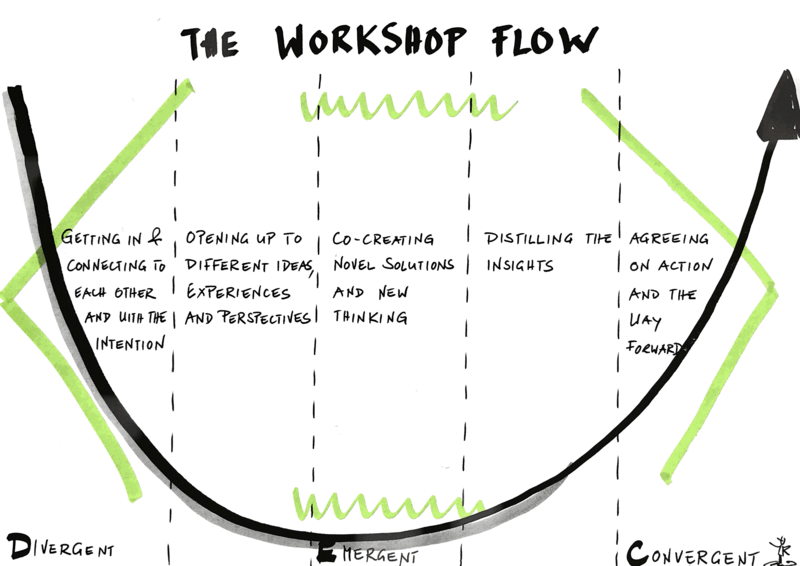 How do you visualize the workshop flow? Hi Nadia. Thanks for your thoughts here. I’ve always been dissatisfied with applying one concept to agenda design. So glad to see other eclectics. I miss you, your insights, your smarts and your infectious laugh. Stay healthy and happy my distant friend.